What do we mean by progression? 'Progression' is about helping an individual gain skills, confidence & resilience through the act of volunteering itself, and in so doing help them move from a hard or tricky position in their life to a better one. This progression is often best achieved by a mentored approach, with the individual being encouraged and helped thorugh the decision-making process by peers or recognised esperts working in recognised local charities or other 3rd sector organisations. VolHub is a bespoke module for the ROVA platform - it was commissioned to allow people to undertake volunteering activities, develop their own resilience and progression through difficult times. 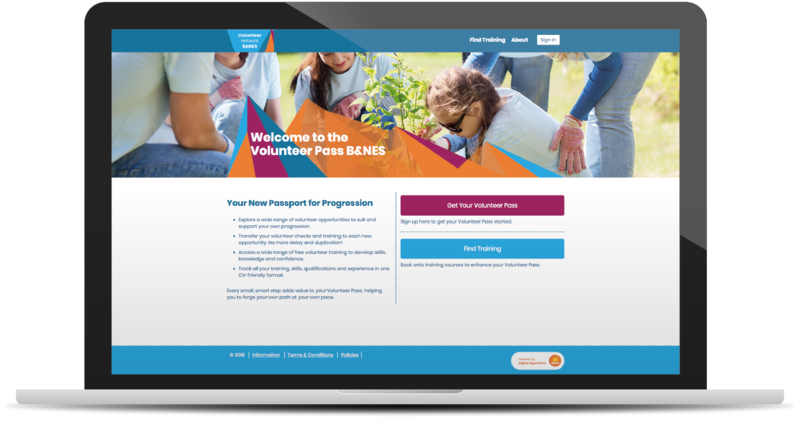 Many different provider organisations present opportunities and training for volunteers, to help them build a CV of achievements and experiences, creating a brand new care pathway from existing commmunity assets. By using this website and agreeing to these terms and conditions, you consent to the terms of Digital Algorithms' copyright notice, medical disclaimer, and linking policy. Unless otherwise stated, Digital Algorithms and/or its licensors own the intellectual property rights in the website and material on the website. Subject to the license below, all these intellectual property rights are reserved. You must not conduct any systematic or automated data collection activities (including without limitation scraping, data mining, data extraction and data harvesting) on or in relation to this website without Digital Algorithms' express written consent. You must not use this website for any purposes related to marketing without Digital Algorithms' express written consent. Digital Algorithms reserves the right to restrict access to areas of this website, or indeed this entire website, at Digital Algorithms' discretion. If Digital Algorithms provides you with a user ID and password to enable you to access restricted areas of this website or other content or services, you must ensure that the user ID and password are kept confidential. Digital Algorithms may disable your user ID and password in Digital Algorithms' sole discretion without notice or explanation. You grant to Digital Algorithms a worldwide, irrevocable, non-exclusive, royalty-free license to use, reproduce, adapt, publish, translate and distribute your user content in any existing or future media. You also grant to Digital Algorithms the right to sub-license these rights, and the right to bring an action for infringement of these rights. Your user content must not be illegal or unlawful, must not infringe any third party's legal rights, and must not be capable of giving rise to legal action whether against you or Digital Algorithms or a third party (in each case under any applicable law). Digital Algorithms reserves the right to edit or remove any material submitted to this website, or stored on Digital Algorithms' servers, or hosted or published upon this website. This website is provided "as is" without any representations or warranties, express or implied. Digital Algorithms makes no representations or warranties in relation to this website or the information and materials provided on this website. business relationships, loss of reputation or goodwill, or loss or corruption of information or data. These limitations of liability apply even if Digital Algorithms has been expressly advised of the potential loss. You accept that, as a limited liability entity, Digital Algorithms has an interest in limiting the personal liability of its officers and employees. You agree that you will not bring any claim personally against Digital Algorithms' officers or employees in respect of any losses you suffer in connection with the website. Without prejudice to the foregoing paragraph, you agree that the limitations of warranties and liability set out in this website disclaimer will protect Digital Algorithms' officers, employees, agents, subsidiaries, successors, assigns and sub-contractors as well as Digital Algorithms. You hereby indemnify Digital Algorithms and undertake to keep Digital Algorithms indemnified against any losses, damages, costs, liabilities and expenses (including without limitation legal expenses and any amounts paid by Digital Algorithms to a third party in settlement of a claim or dispute on the advice of Digital Algorithms' legal advisers) incurred or suffered by Digital Algorithms arising out of any breach by you of any provision of these terms and conditions, or arising out of any claim that you have breached any provision of these terms and conditions. Without prejudice to Digital Algorithms' other rights under these terms and conditions, if you breach these terms and conditions in any way, Digital Algorithms may take such action as Digital Algorithms deems appropriate to deal with the breach, including suspending your access to the website, prohibiting you from accessing the website, blocking computers using your IP address from accessing the website, contacting your internet service provider to request that they block your access to the website and/or bringing court proceedings against you. Digital Algorithms may revise these terms and conditions from time-to-time. Revised terms and conditions will apply to the use of this website from the date of the publication of the revised terms and conditions on this website. Please check this page regularly to ensure you are familiar with the current version. Digital Algorithms may transfer, sub-contract or otherwise deal with Digital Algorithms' rights and/or obligations under these terms and conditions without notifying you or obtaining your consent. These terms and conditions constitute the entire agreement between you and Digital Algorithms in relation to your use of this website, and supersede all previous agreements in respect of your use of this website. These terms and conditions will be governed by and construed in accordance with all applicable local laws, and any disputes relating to these terms and conditions will be subject to the exclusive jurisdiction of the courts of the United Kingdom. The full name of Digital Algorithms is Digital Algorithms Ltd.
Digital Algorithms is registered in England under registration number 08209840. Digital Algorithms registered address is Wellington House, Tunbridge Road, Chew Magna, Bristol BS40 8SP. Your privacy is important to Digital Algorithms. This privacy statement provides information about the personal information that Digital Algorithms collects, and the ways in which Digital Algorithms uses that personal information. any other information that you send to Digital Algorithms. Where Digital Algorithms discloses your personal information to its agents or sub-contractors for these purposes, the agent or sub-contractor in question will be obligated to use that personal information in accordance with the terms of this privacy statement. In addition to the disclosures reasonably necessary for the purposes identified elsewhere above, Digital Algorithms may disclose your personal information to the extent that it is required to do so by law, in connection with any legal proceedings or prospective legal proceedings, and in order to establish, exercise or defend its legal rights. Digital Algorithms will take reasonable technical and organisational precautions to prevent the loss, misuse or alteration of your personal information. Digital Algorithms will store all the personal information you provide on its secure servers. Digital Algorithms is not responsible for the privacy policies or practices of any third party. The copyright in this website and the material on this website (including without limitation the text, computer code, artwork, photographs, images, music, audio material, video material and audio-visual material on this website) is owned by Digital Algorithms and its licensors. Digital Algorithms does not grant you any other rights in relation to this website or the material on this website. In other words, all other rights are reserved. For the avoidance of doubt, you must not adapt, edit, change, transform, publish, republish, distribute, redistribute, broadcast, rebroadcast or show or play in public this website or the material on this website (in any form or media) without Digital Algorithms' prior written permission. You may request permission to use the copyright materials on this website by writing to Digital Algorithms. Digital Algorithms takes the protection of its copyright very seriously. If Digital Algorithms discovers that you have used its copyright materials in contravention of the license above, Digital Algorithms may bring legal proceedings against you seeking monetary damages and an injunction to stop you using those materials. You could also be ordered to pay legal costs. If you become aware of any use of Digital Algorithms' copyright materials that contravenes or may contravene the license above, please report this by our webform at www.digitalalgorithms.com or by post to Wellington House, Tunbridge Road, Chew Magna, Bristol BS40 8SP. If you become aware of any material on the website that you believe infringes your or any other person's copyright, please report this by our webform at www.digitalalgorithms.com or by post to Wellington House, Tunbridge Road, Chew Magna, Bristol BS40 8SP. Digital Algorithms uses Google Analytics to analyse the use of this website. Google Analytics generates statistical and other information about website use by means of cookies, which are stored on users' computers. The information generated relating to our website is used to create reports about the use of the website. Google will store and use this information. Digital Algorithms welcomes links to this website made in accordance with the terms of this linking policy. By using this website, you agree to be bound by the terms and conditions of this linking policy. Appropriate link text should always be used. Digital Algorithms has no control over the contents of third party websites, and Digital Algorithms accepts no responsibility for them or for any loss or damage that may arise from your use of them. You agree that, should Digital Algorithms request the deletion of a link to our website that is within your control, you will delete the link promptly. If you would like Digital Algorithms to remove a link to your website that is included on this website, please contact Digital Algorithms using the contact details below. Note that unless you have a legal right to demand removal, such removal will be at our discretion. Digital Algorithms may amend this linking policy at any time by publishing a new version on this website. This website may contain general information about medical conditions and treatments. The information is not advice, and should not be treated as such. The medical information on this website is provided "as is" without any representations or warranties, express or implied. Digital Algorithms makes no representations or warranties in relation to the medical information on this website.